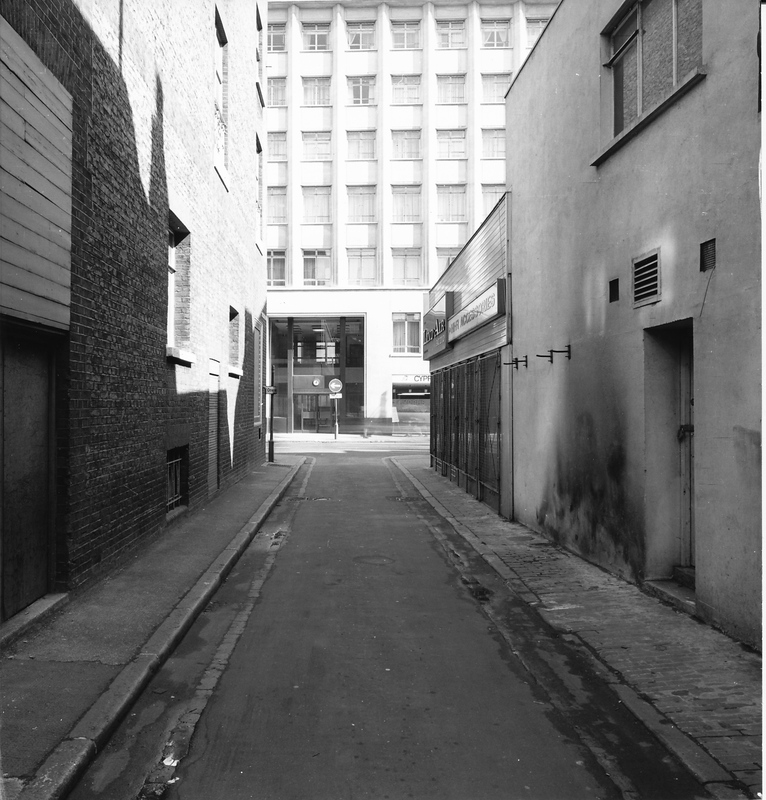 It’s hard to believe if you were to walk out of the Time Out building on Tottenham Court Road you would have seen this narrow street. But up until the mid-1970s that is what you would have found. 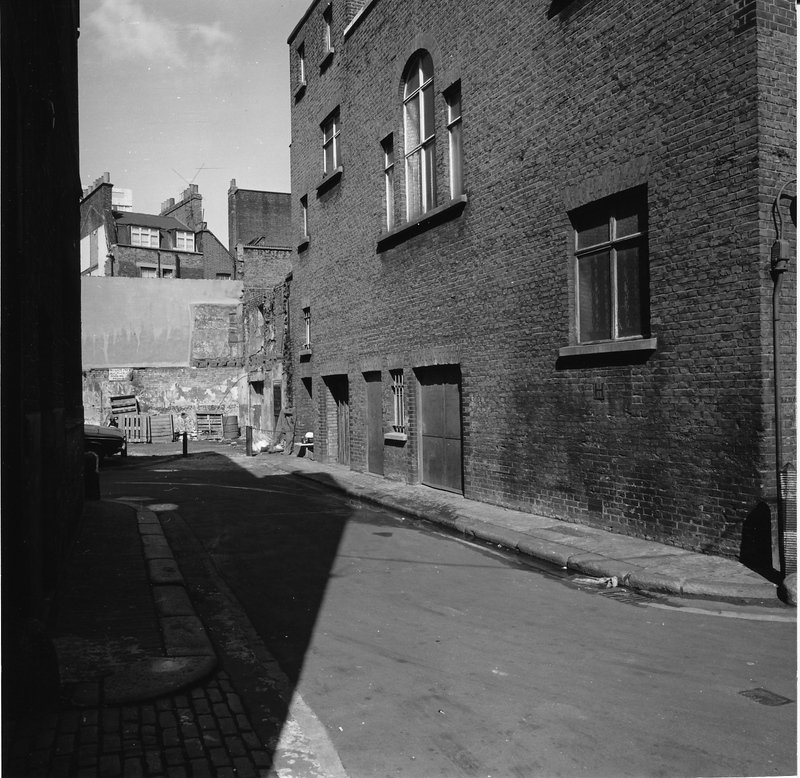 A few yards off one of London’s busiest roads you would have peered into a narrow street leading to a warren of workshops, storage units and people’s homes. Tudor Place as seen from Tottenham Court Road. Picture taken by unknown photographer in 1972. 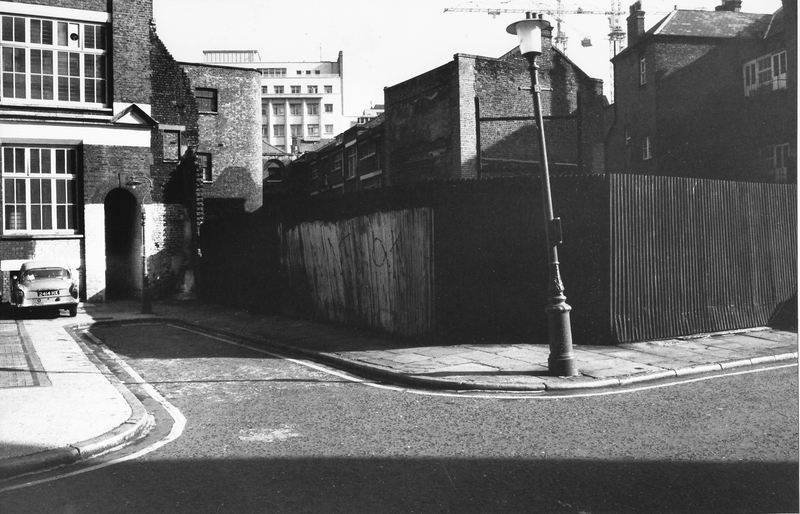 These photographs were taken by person’s unknown in 1972 and are in the archive of pictures at the Fitzrovia Neighbourhood Association and Fitzrovia News office. 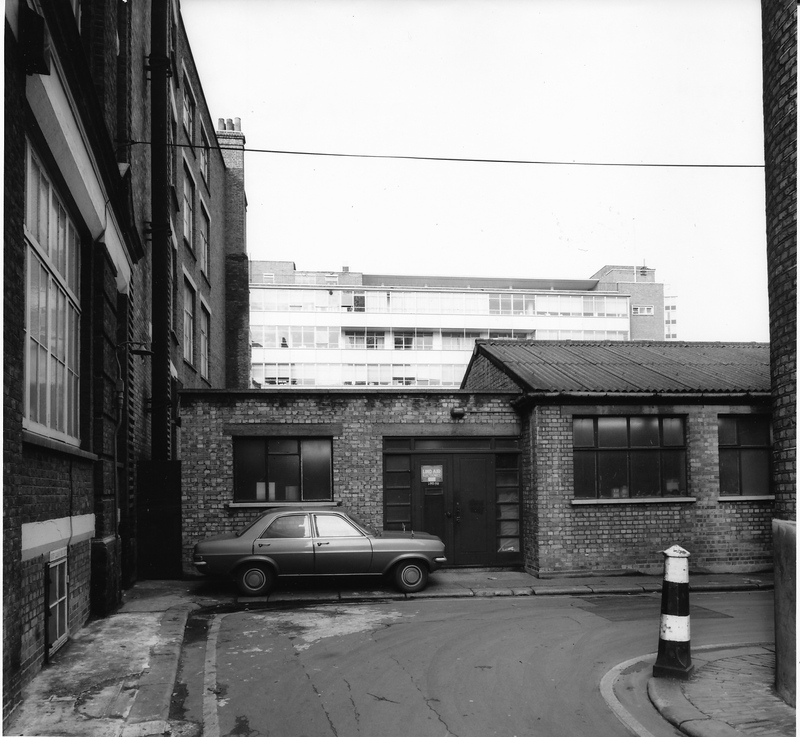 The Time Out building, as seen looking north-east out of Tudor Place in 1972. The single storey building on the right was on the site of the Black Horse public house. Walk down this street and turn around and you would have seen the view above: the one way sign on Tottenham Court Road, and the distinctive double height entrance to the Time Out building. The clock above the revolving door is still there. But time has never stood still for long in this part of London; and Time Out are shortly to leave and a new generation of developers are about to make their mark on the eastern side of Tottenham Court Road. Looking north in Tudor Place at the back of the houses with chimneys in Stephen Street. But for the time being we can turn back the clock and explore the western side of the road and see what would have been found 40 years ago if we’d taken a stroll around the south-eastern part of Fitzrovia and into this small quarter hemmed in by Tottenham Court Road, Oxford Street, Rathbone Place and Percy Street. Tudor Place north side looking east. This was the way into what was known as the Gort Estate (named after the Gort Family), and now all but forgotten. The property came to the Gort family through Elizabeth Mary Viscountess Gort as daughter of John Jones and as widow of George Tudor. Presumably that’s where the name Tudor Place originates. If we continue our journey, we enter Tudor Place, turn north and continue to walk around the square, island building at its centre following the footsteps of the photographer in an anti-clockwise direction until we almost come full circle. Looking north from the north-west corner of Tudor Place towards the Ofrex (now BFI) building on Stephen Street in the background. In the background of the pictures we can see clues as to where we are by seeing parts of buildings that are there today. Continuing around the centre building and turning to face north we can see in the background the Ofrex building (now the BFI building) in Stephen Street. From the west side of Tudor Place looking south towards CentrePoint in the background. Then the photographer turns their gaze to look south to capture Tudor Place with the north face of the Centre Point building in the background, which had only been completed a few years before these pictures were taken. And finally to almost come full circle to look east, and see again the Time Out office building over the tops of the older industrial buildings. The south side of Tudor Place with Time Out building in the background. If you’d wandered around the cul-de-sac of Tudor Place you could have found a tiny alleyway at its western end. 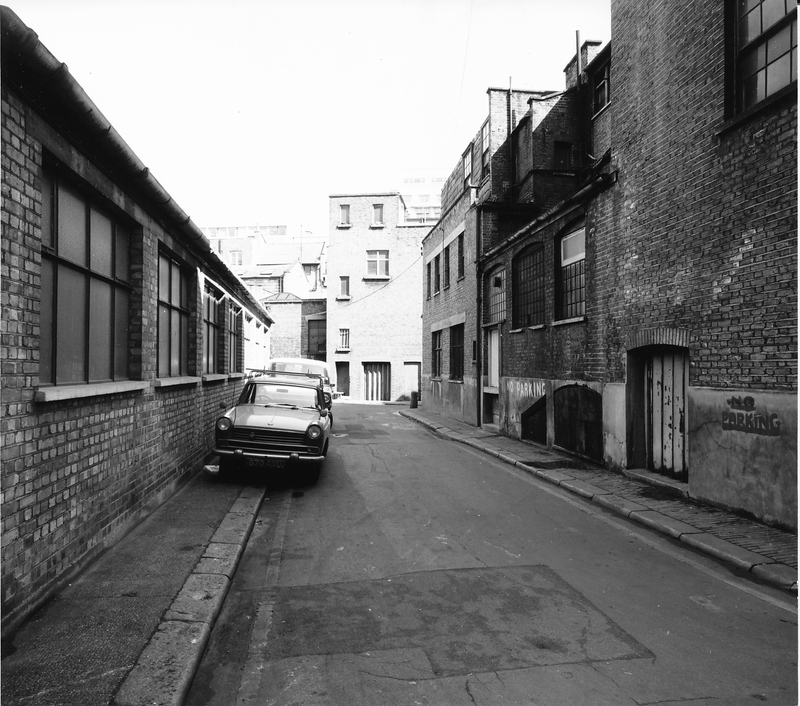 An alleyway similar to the still surviving Newman Passage a few hundred metres away. 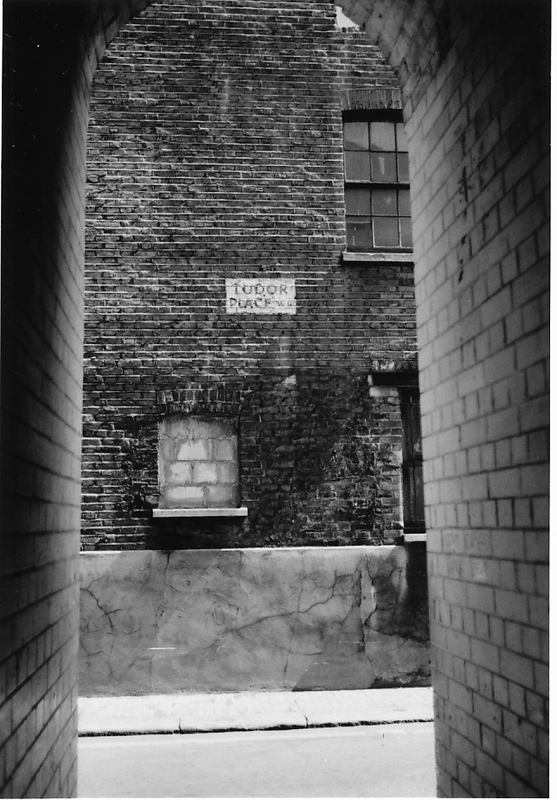 An alleyway similar to this still survives to the northwest at Newman Passage which connects Rathbone Street to Newman Street. 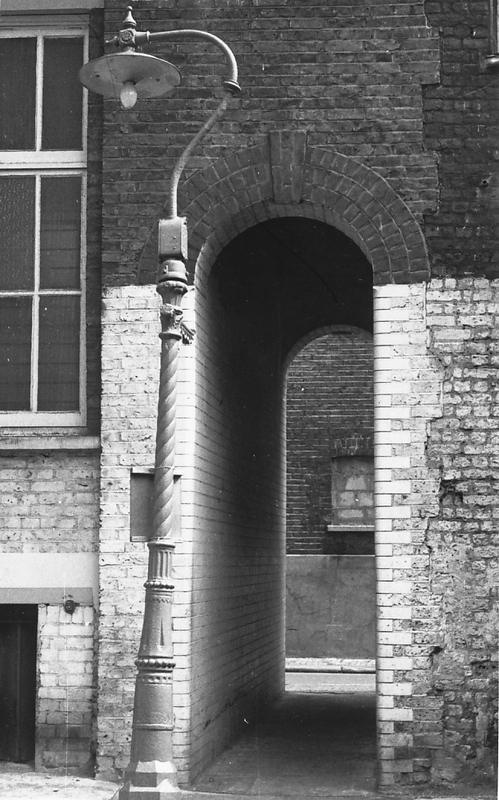 From Tudor Place via this unnamed, arched cut-through you would have arrived in Gresse Street near the junction with Evelyn Yard. 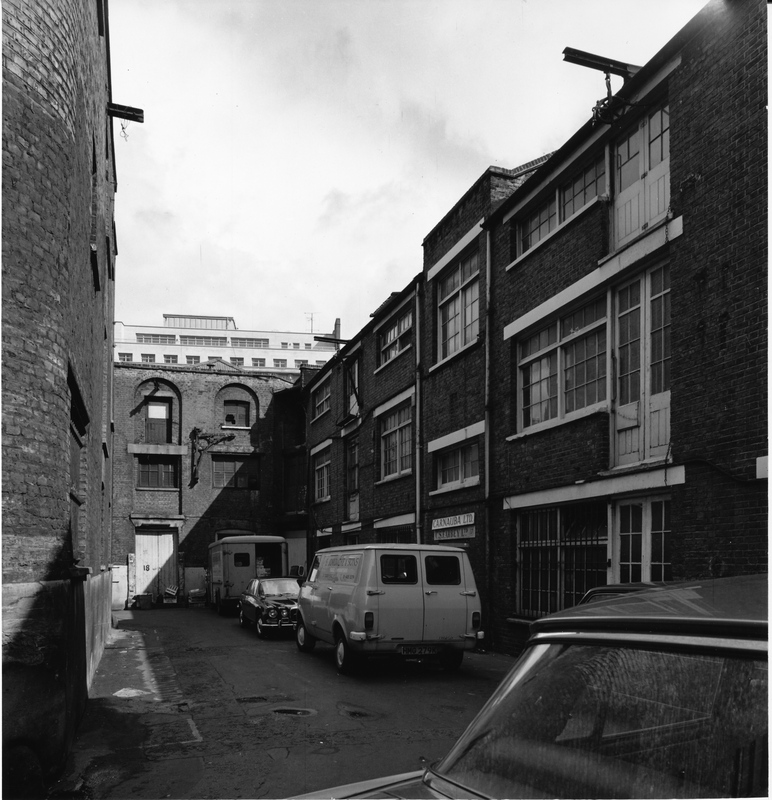 By the time these pictures were taken, the buildings had been allowed to decay and some were already partly demolished by the owners, and a large part of the south-west corner of Tudor Place was being used as a car park. The progress of building along Tottenham Court Road is indicated by the petition to the Commissioners of Sewers from John Hassell and others in 1720, that the common sewer being choked by mud and filth, might be cleared. In 1722 he applied for leave to enlarge the sewer on the west side of Tottenham Court Road before several houses belonging to him, the sewer being too small. The surveyor reported that the frontage was 410 feet, upon which there were then erected or intended to be erected 15 houses next the road, with a stable yard backwards (Black Horse Yard, alias Tudor Place). The frontage of 410 feet extended from the Black Horse to the corner of Percy Street. In 1732, again, Hassell and his tenants complained that the common sewer was choked and that the rainwater overflowed the kitchens and cellars of their houses. In 1752 the Hassell estate was sold in lots, subject to ground rents and the original lease, the southern portion of Gresse Street having then been built, while the area between Gresse Street and the houses in Tottenham Court Road was occupied by Black Horse Yard (Tudor Place), with extensive stabling. A house lately tenanted by the Hon. Charlotte Hassell, with a large garden, occupied two acres, or half the estate and this was bought by Peter Gaspard Gresse. He does not appear to have built on it until the year 1768, when he laid out the northern part of Gresse Street and Stephen Street. His son was John Alexander Gresse, painter and drawing master. — Survey of London. The alleyway connected Tudor Place with Gresse Street. And out the other side where the upper part of the Time Out building can be seen in the background. Behind the hoarding lies a car park in the space where buildings had been demolished. 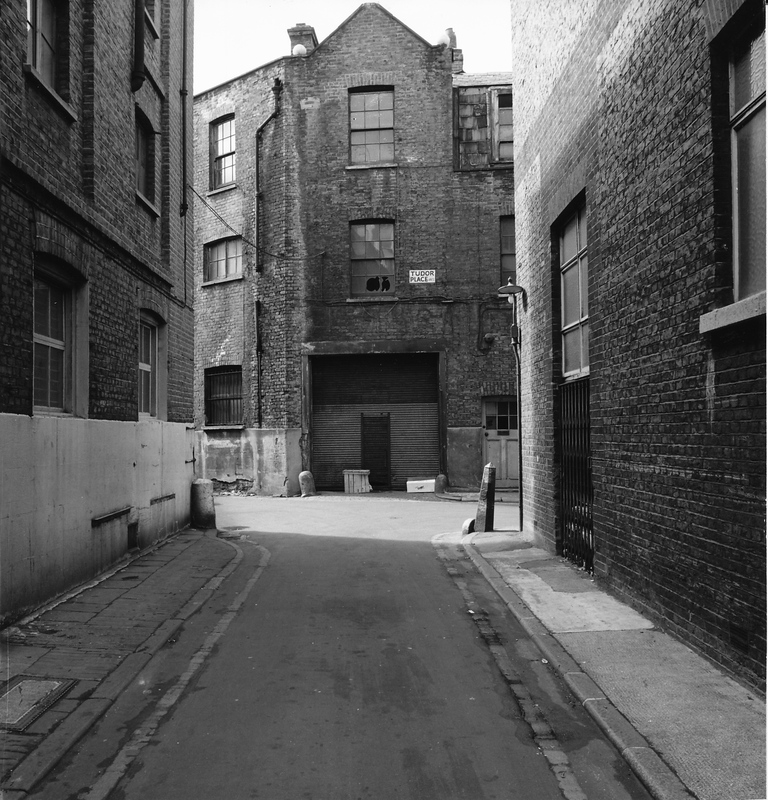 “This little by-way was [in the mid-19-century] filled with private houses, and led directly into Rathbone Place” (page 96). 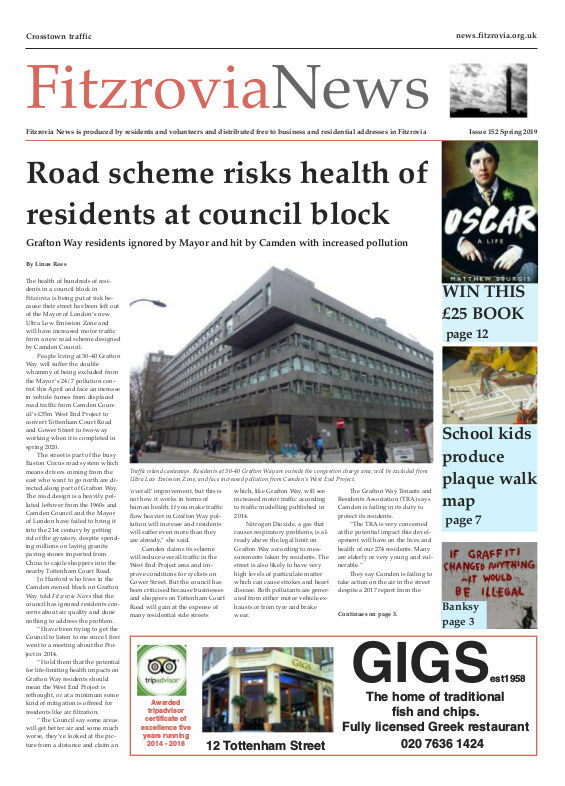 The early editions of the Tower community newspaper in 1973 tell the story of how the Gort Estate came to be demolished, how the people who lived and worked there fought for their homes and how eventually the whole lot came to be bulldozed to make way for what was to become the EMI building. The irony was: EMI never moved in. The site eventually became the Central Cross office building with a retail arcade along Tottenham Court Road, the Odeon cinema, and a block of flats owned by Camden Council at Gresse Street. Recently the whole site has been bought by the property developers Derwent London who are currently executing their own vision for change along the Tottenham Court Road. The arcade is to go and be filled in with larger retail units and the Stephen Street entrance to the building is also to be redeveloped, extending the building up to the street line and adding more square metres of office space. 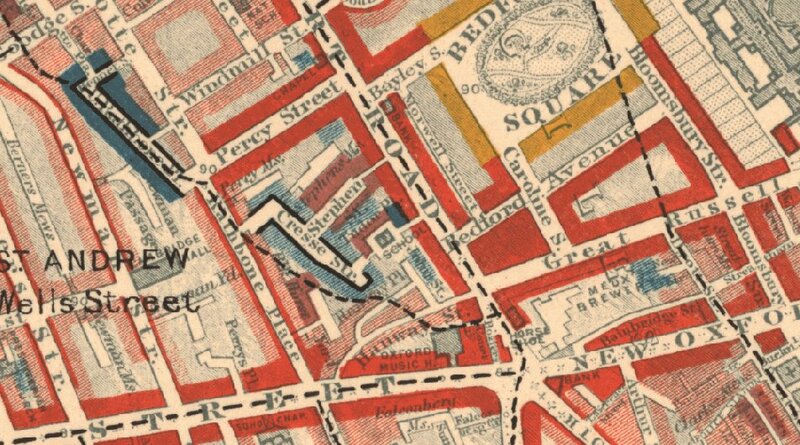 An old A to Z shows the old street pattern of Tudor Place in its context with the nearby Newman Passage, Perry’s Place, and Hanway Street and Place; and helps us to place the photographs in their settings. Tudor Place is shown at the centre of the map, part of a network of crooked and intimate streets. Booth’s map of 1898-1899 showed Tudor Place and Gresse Street as “poor” to “mixed” surrounded by “fairly comfortable” to “middle class”. It also makes reference to a school in Tudor Place, which another map describes as a boys Roman Catholic School. 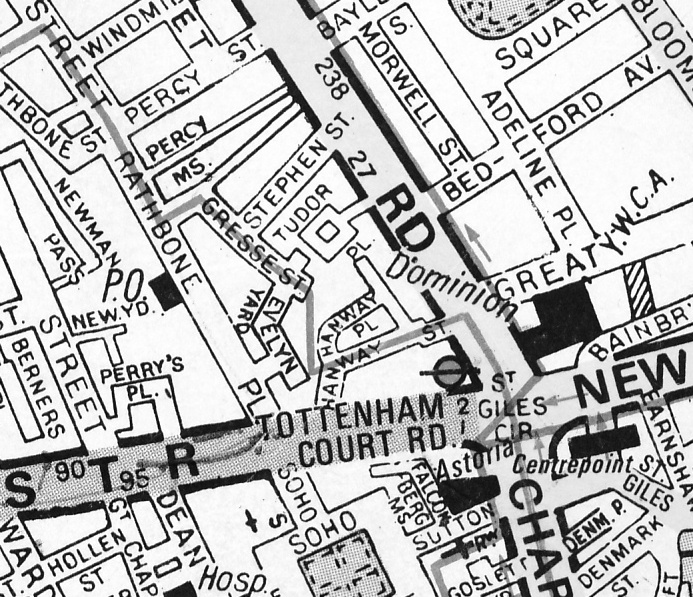 Booth’s map of 1898-1899 shows Tudor Place and Gresse Street. 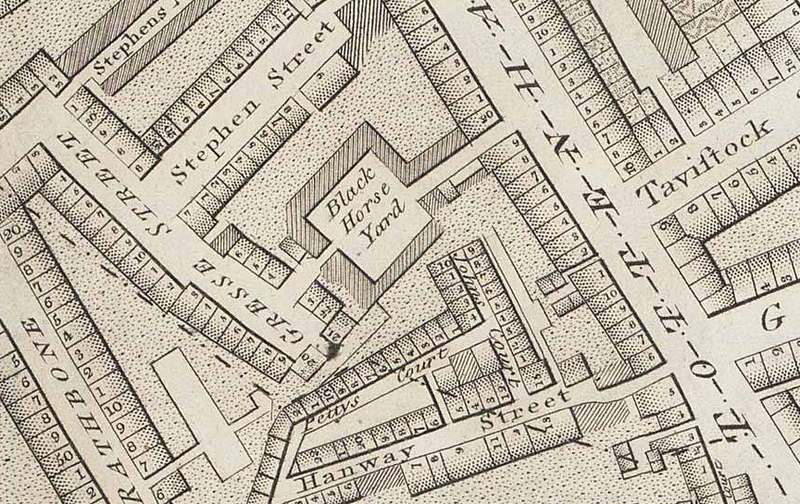 Tudor Place was previously called Black Horse Yard, according to Horwood’s map of London 1792-9. The Black Horse was also the name of a public house (now a hamburger bar) at the southern end of Rathbone Place, and another pub of the same name on the corner of Tottenham Court Road and Tudor Place. Tudor Place was previously known as Black Horse Yard. In the next feature, I’ll look at Tottenham Court Road. Really fascinating article. The alley looks like several still extant in Clerkenwell. Well done to whoever researched and wrote this piece. 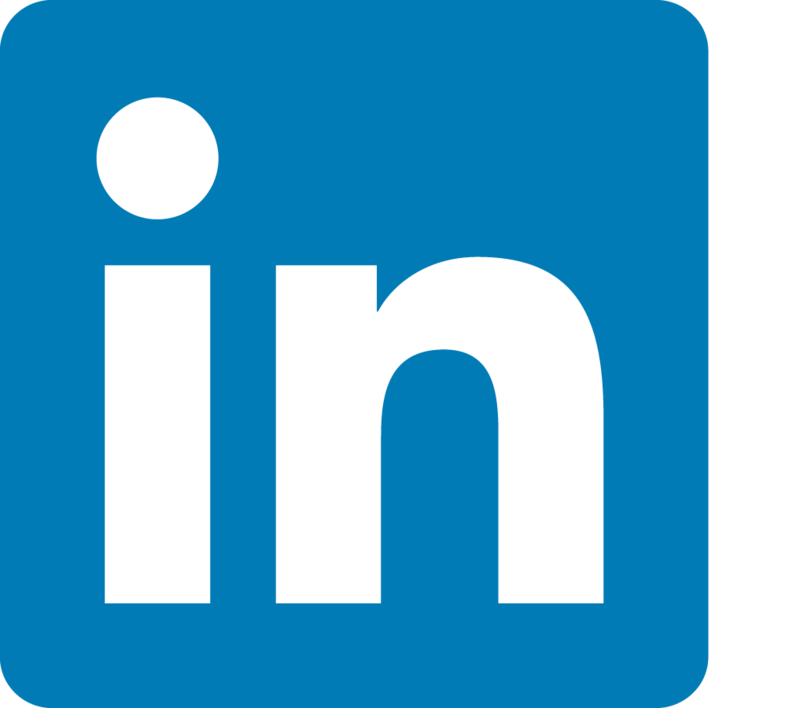 Now properly credited. But we’ve yet to identify the photographer. That was a great read. Brilliant photographs. Excellent work, Ms Lovely. Good to be able to acknowledge the real author. I was at the Camden Archive above Holborn Library yesterday and saw an old map of this area, where I discovered Tudor Place and the RC School for boys. I found this article on line today; very interesting, I didn’t realise that Tudor Place had existed until fairly recently. Thank you so much for this. 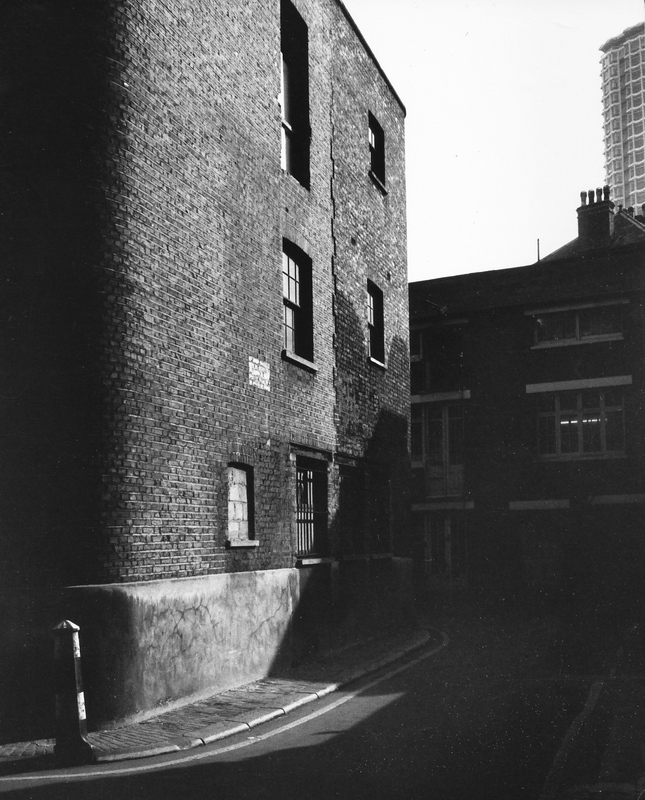 I lived at the time in Hanway Place, I was 12 years old in 1972. I used to ride my bike round Tudor Place and climb up the warehouse buildings at that time and earlier. Part of my own personal London that no longer exists. In some small way, the destruction of my playgrounds causes me to resent property developers and the eradication of personal memories for someone else’s profit. So pleased to be able to see Tudor Place again. Wonderful photographs and article. My great grandparents, and grandmother all lived in Gresse Street in the 1800’s and I worked overlooking Gresse Street in the Ofrex building in the eighties. Shame it has all gone. Well the Ofrex building is still there, it’s the British Film Institute building. The buildings opposite in Stephen Street are undergoing another transformation, as are the ones fronting onto Tottenham Court Road.